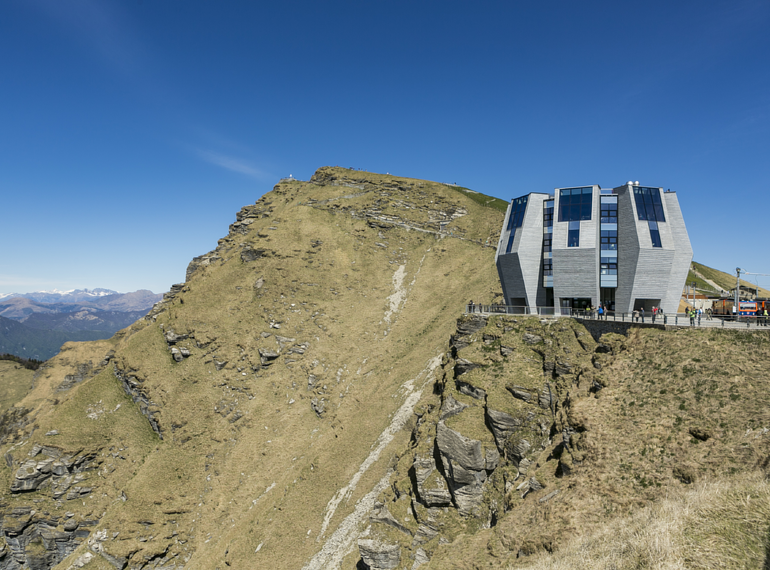 The "Stone Flower" designed by the renowned architect Mario Botta is the new landmark on Monte Generoso at 1704 m. The building serves as a restaurant at the mountain’s summit with a central octagonal room surrounded by flower petals. 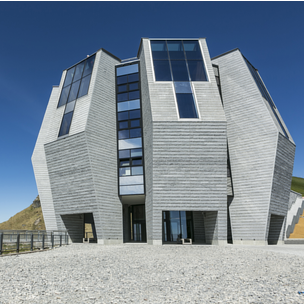 The flower head´opens to make space for a terrace, which follows the line of the mountain ridge to the east. The layout of the individual structural elements (the petals) create a group of five-story towers, each narrow at the bottom, spreading outwards to mid height and tapered to narrow again as they reach their final height. This shape explains the building’s name ‘The Stone Flower (Fiore di Pietra). 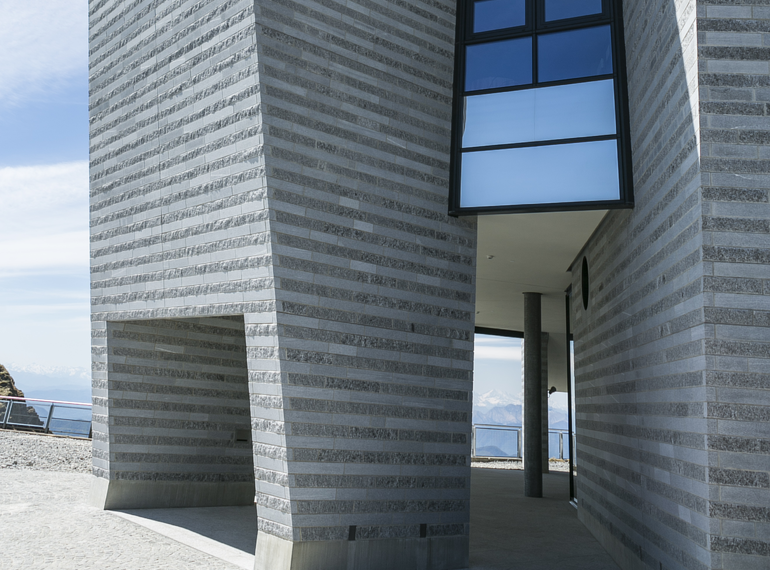 The reinforced concrete structure is clad with grey natural stone with alternating horizontal stripes of smooth or textured surface finishes; this gives the structure a textured pattern. The somewhat monolithic looking towers are connected by substantial glass surfaces. 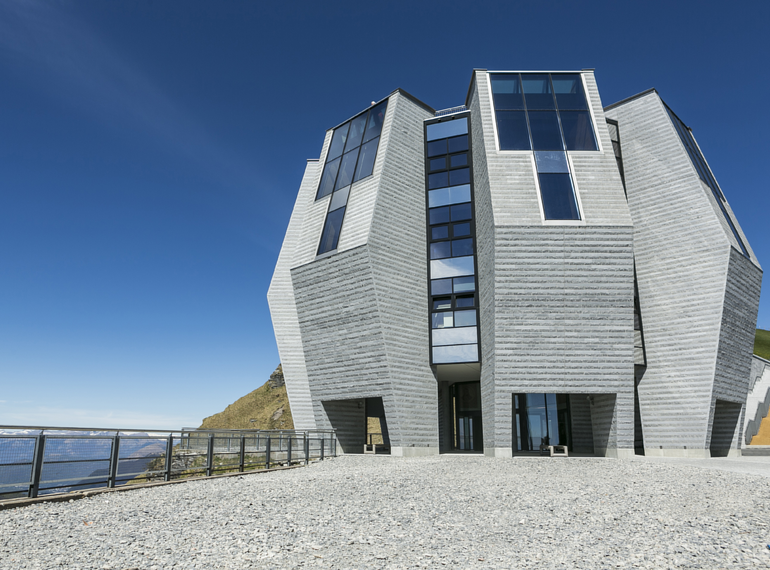 The stone flower is perched on a rocky mountain plateau and provides 360 degree views of the breath-taking panorama. 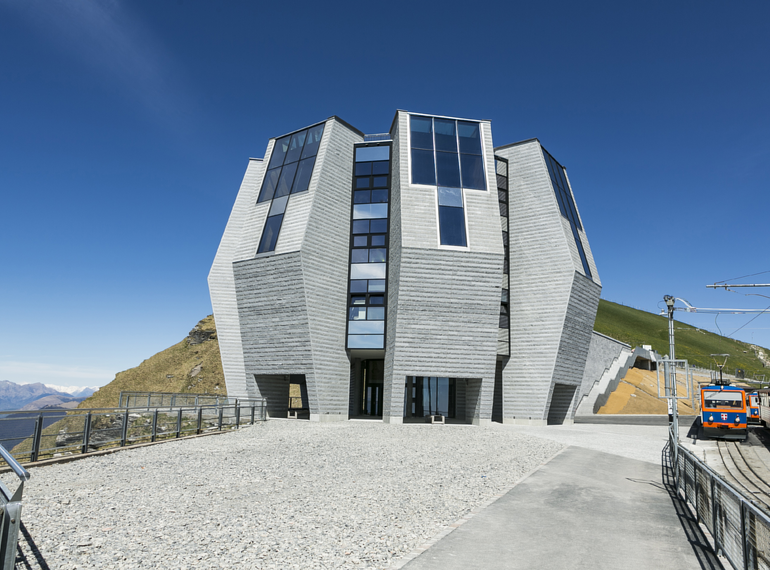 HALFEN brought its extensive expertise in façade fixings to this extraordinary building project. 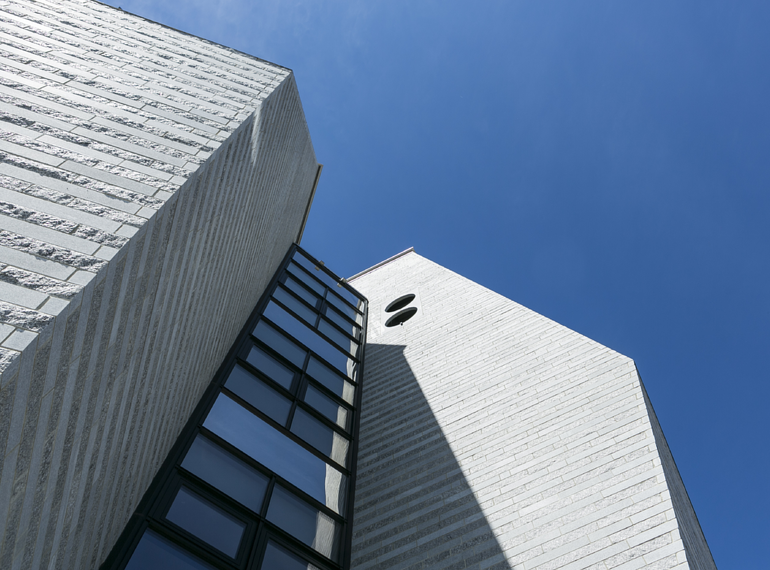 HALFEN delivered specially designed type HK4-FV-SSK support brackets adapted for the two different angles of the façade. 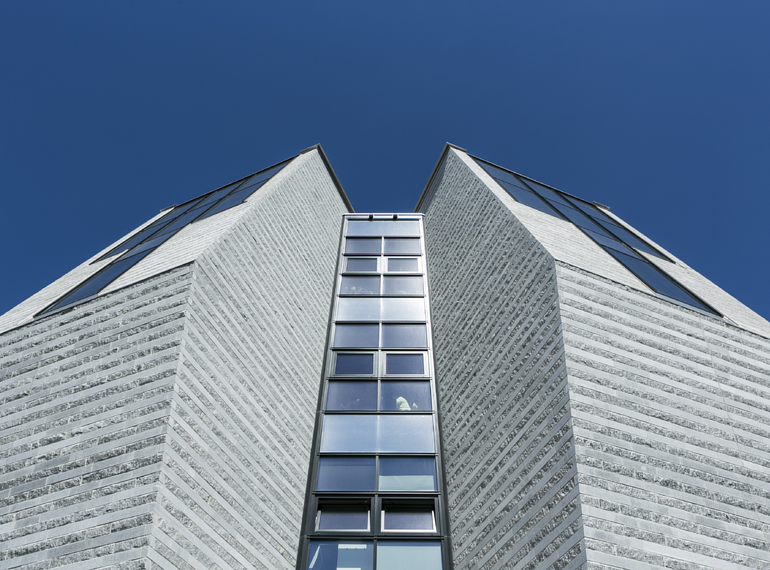 An additional, vertical, SUK type channel support system was installed behind the natural stone for support in the overhanging sloped areas of the façade. Horizontal channels were then installed with specially developed fixings at every third joint. The whole structure is designed to withstand wind loads of 2,16 kN/m2.